This week we have a few wonderful resources for learning more about dragonflies and damselflies. 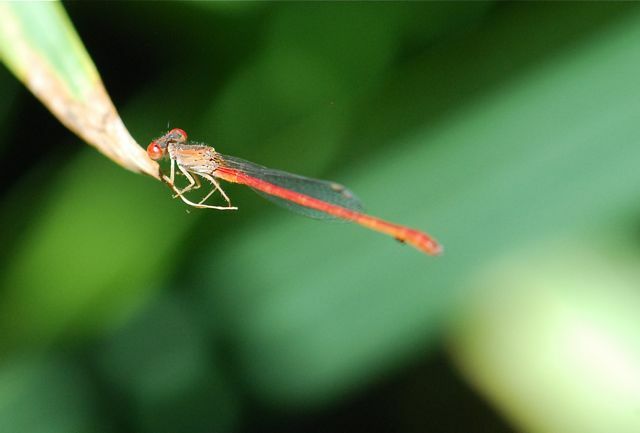 What is a dragonfly and what is a damselfly? Dragonflies are the large, showy insects that you see around ponds and other bodies of water. When they land on a plant or other object, they hold their wings straight out. Damselflies, on the other hand, are usually a bit finer, more delicate looking. They rest with their wings folded behind their backs. Look closely and you will see they often sport bright colors, such as red, green and bright blue. They can be just as colorful and fun to watch as birds or butterflies. The adult female dragonflies and damselflies lay their eggs in the water, or on plants or debris in or near the water. The eggs hatch into nymphs (sometimes also called naiads) that feed on other organisms in the water. After a year or two, they crawl to the surface and the adult emerges. There is no transitional or pupal stage. Nothing beats strolling out to a pond, stream or lake and simply watching dragonflies and damselflies in action. One of the first things you notice when you see dragonflies or damselflies is their strong ability to fly. They have four wings, and can move the fore and hind wings independently. Their wing movement may not be easy to see until you capture them on film. In this video clip, you can see a dragonfly's amazing flight slowed down. Often dragonflies are searching for food when they are flying. They catch other flying insects, such as mosquitoes, while on the wing. In this video you can see dragonflies catching flying termites (although the video title identifies the prey as ants). According to a recent newspaper article, Arizona dragonfly watching a growing hobby at the Arizona Republic, dragonfly watching is increasing in popularity. Several of our local nature areas are now offering dragonfly walks lead by experts. Check in your area for local events related to dragonflies, especially in the summer. I recently found a wonderful blog called The Dragonfly Woman. 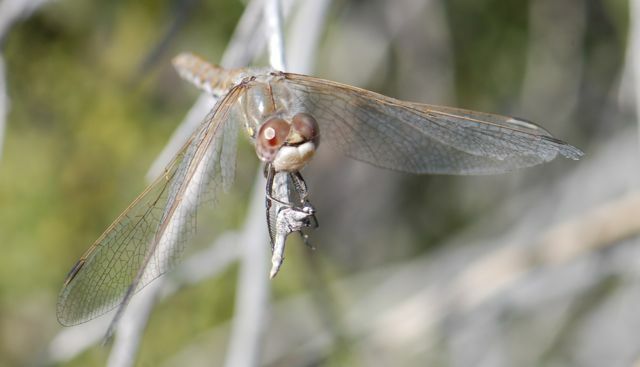 University of Arizona Entomology Ph.D. student Christine Goforth has started a citizen science project about dragonfly swarming (more about that in a minute), plus has loads of cool information about dragonflies and insects in general. What is a dragonfly swarm? When a group of insects gather together in a large group, for whatever purpose, it is often called a swarm. In the case of dragonflies, the swarm may be a bunch of dragonflies feeding together at one location. This is called a static swarm. Dragonflies can also form large groups and move from place to place. This is called a migratory swarm. Are you interested in a citizen science project? The Dragonfly Woman has been collecting reports of dragonfly swarms throughout the world. Check her blog for summaries from last year and to report a dragonfly swarm yourself. You might like to see Dragonfly Woman's posts about making a dragonfly collection using a scanner as well. I love the idea of being able to preserve the insect's image and let the dragonfly go again. Edit: I just found this lovely dragonfly craft, and knew I had to add it here. Do dragonflies occur where you live? Have you ever seen a dragonfly swarm? Great post! This is definitely the season for them around here.